This article is about receiving radio stations operating in the VLF band (3-30 kHz). Due to the very low frequency, receiving such stations requires some special equipment, since most radios don’t support these low frequencies. One of the interesting stations in this band is SAQ, which occasionally transmits at 17.2 kHz. Other stations include submarine communications and time services. The Alexanderson Alternator, which generates the 17.2 kHz carrier (credits). 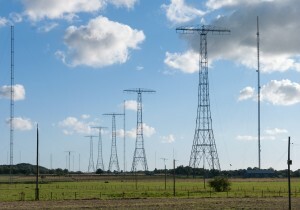 SAQ is the callsign of the Varberg Radio Station at Grimeton, Sweden. Its first transmitter came on air in 1924 for telegraph communications with Radio Central, New York. It operates on a very low frequency: 17.2 kHz (!). Later the transmitter was used for submarine communications. In 1996 the transmitter was finally shutdown, after more than 70 years of operation. From 2004 the radio station is classified as a world heritage site by UNESCO. 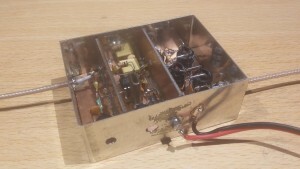 The so-called Alexanderson transmitter is everything you don’t expect of a transmitter. It is a true machine, with three main parts: a 500 HP electrical motor, a gear box and a generator. 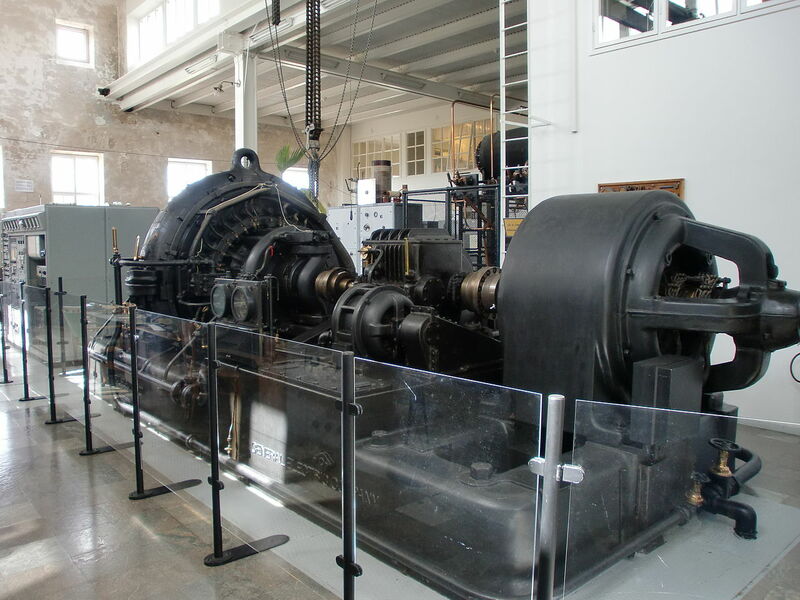 The gear box causes the generator to produce an AC current of 17.2 kHz with an output power of about 80 kW. At this level the transmitter is running very relaxed, since it is originally built to speed up to 40 kHz with a maximum output power of 200 kW. The power is driven into a large antenna, which looks like a power transmission line of almost 2 km. At least two times a year the machine is powered up by volunteers (veterans) of the Alexander Association to broadcast a message to the world, typically in the early Summer at Alexanderson Day, and on Christmas Eve. At such moments lots of radio enthusiasts tune their radios to 17.2 kHz to copy the telegraph message. Simplified visualisation of the radio spectrum, with the VLF band on the far left. Receiving VLF stations like SAQ is fairly simple, but not straightforward. There are two things to consider: the antenna and the receiver. 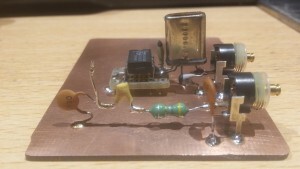 No, you don’t need a huge antenna, indeed you can build a very small active antenna, maybe just 4 x 10 cm. It can be easily placed on a balcony, in the attic or on a tonkin stick in the garden. A good example is the Mini-Whip by PA0RDT, which is a very simple yet great performing antenna for VLF. But there is more, like active receiving loops and ferrite based antennas. 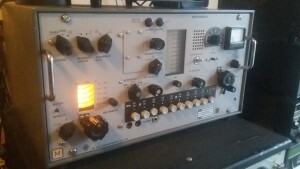 Adrian PA0RDA owns a Telefunken ELK 639, on this picture the (V)LF receiver is activated. Besides the antenna, the other concern is probably the receiver; the VFO of your radio may run down to the VLF band, however the receiver itself is not able to handle these low frequencies, and/or the radio’s internal band filters will probably cut off these frequencies. For example, the Kenwood TS-590SG has a VFO which goes all the way down to 30 kHz, but the receiver is not able to handle signals below 130 kHz (as stated in the tech specs listed in its manual). The most common solution to solve this issue is adding a VLF converter, which transponds the VLF band to a higher, more convenient part of the radio spectrum. 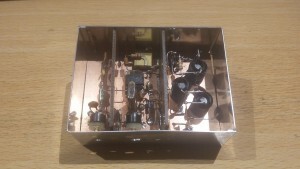 Another way to receive VLF stations is to obtain a vintage radio which includes the VLF band, like the 45 kg Murphy B41 and the less heavy Telefunken ELK 639, both capable to receive VLF from 9.8 kHz. A complete different solution is a piece of software called SAQrx, which turns your PC soundcard into a VLF receiver. A fellow builder gave me a bunch of parts he didn’t use anymore, including some mixers and lots of crystals. This reminded me of converters for VLF reception, and soon (early December) I decided to get my ham radio station prepared for the next SAQ transmission on Christmas Eve. I immediately started building the VLF converter. I finished the converter and with just eight days left I put it to the test. Since I did not have a suitable antenna yet, I took a 50 meter extension reel to act as a small receiving loop antenna and connected it to the input of the converter. The converter’s output was connected to the antenna connector of my IC-718 shortwave transceiver. 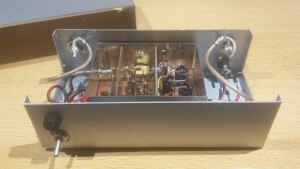 I tuned my receiver to the 30 meter band and tuned the oscillator and filters of the converter. Soon I heard some signals, one of the strongest was the pulse-per-second signal at 77.5 kHz. 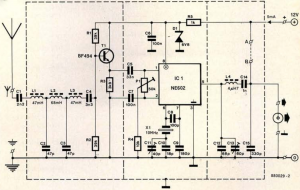 This signal is broadcasted by the DCF77 time signal transmitter in Germany and used by most radio controlled clocks in western Europe. 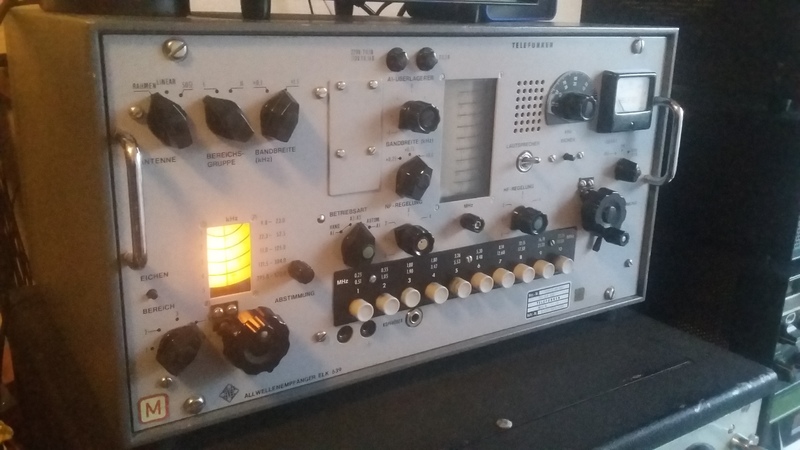 I received some other chirps and beeps too, including other time signals, RTTY, weatherfax and strange sounds that happened to be submarine communications. Wikipedia provides a list of VLF transmitters which helped me to identify the stations. PoRG (left), VLF-converter (on top), 30m transceiver (middle) and step attenuator (bottom). The reception was rather noisy, so the next day I decided to build a proper VLF antenna. The Mini-Whip mentioned above should do the job. I already built one before for Adrian PA0RDA, based on a kit. This time I decided to build one Manhattan-style, since I had all components available. To power the Mini-Whip I used my good old PoRG, although I had to replace its 100 nF DC blocking capacitor with a 10 uF cap to allow passing those damn low frequencies. With the Mini-Whip inside my shack I again tried to listen to VLF. The first result was a bit disappointing, just lots of noise and very weak signals. 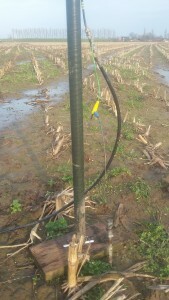 Nevertheless I went on and placed the antenna outside in the cornfield, including a ground rod. Again I listened and now the reception was fantastic! The band was filled with all kinds of signals, with very strong signals from RSDN-20 (19.1 kHz), DHO38 (23.4 kHz), MSF (60 kHz) and DCF77 (77.5 kHz). With just 4 days to go, I was ready for SAQ reception. This diagram shows all the components I use for VLF reception: Mini-Whip, PoRG, step attenuator, VLF-converter, and shortwave receiver. 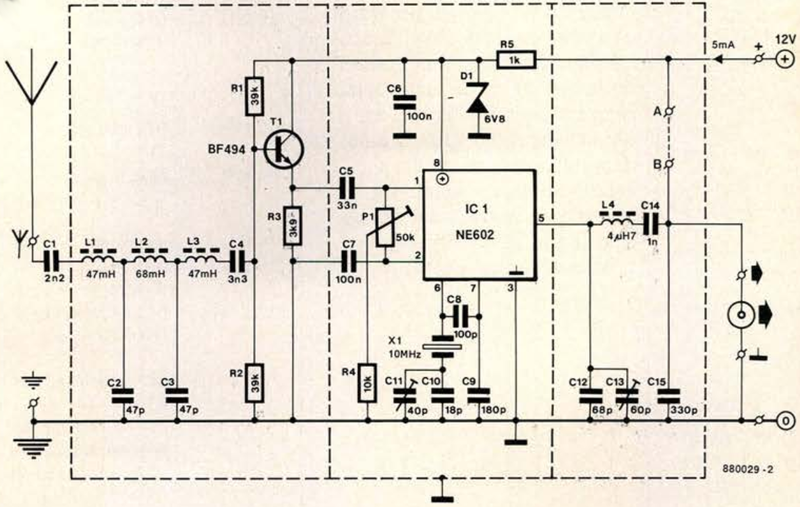 Circuit of the VLF converter as published in Elektuur, June 1988. There are lots of designs available, the one I use was originally published in the dutch electronics magazine Elektuur, June 1988. This converter transfers reception of the VLF band to 10 MHz (30 meter band). So I should tune my receiver to 10000 + 17.2 = 10017.2 kHz to receive SAQ. The other way around: when my receiver display shows a frequency of 10.077.5 kHz, I’m actually listening to 77.5 kHz, which is the DCF77 transmitter in Germany. The circuit itself consists of three parts: input, mixer and output. The input part consists of a lowpass filter and a simple amplifier (BF494). In the second part the signal is mixed (NE602) with the signal of a 10 MHz crystal oscillator. The product is then filtered and matched to the low input impedance of the receiver. The three parts are separated by placing shields in-between. 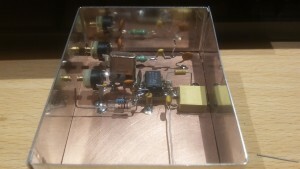 The complete circuit is put in a metal box to get rid of interfering signals. With these low frequencies the input filter contains some rather large inductions, in this case 47 mH and 68 mH. I bought these shokes (they look a bit like elco’s) since they are good enough for these low frequencies and the low Q is not a real issue here. 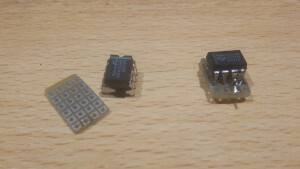 Although the article included a PCB design I built the converter Manhattan-style. After building the circuit, it needs some adjustments for optimal use. 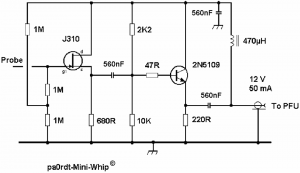 First apply 12 V DC to the circuit en verify that there is 6.8 volt at pin 8 of the NE602. Then connect the output to a suitable receiver and tune it to 10.000 kHz, mode CW. Also activate the receiver’s attenuator (when available). You should here a loud carrier, if not adjust C11. Next adjust P1 to minimal signal (S-meter). Then turn C11 to zero-beat. Now find a radio station and tune C13 to maximum signal. Do NOT place the A-B jumper! 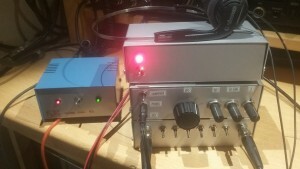 The A-B jumper allows you to power the converter using a phantom power supply in your receiver. Most receivers don’t have this function, so leave the jumper open. Externally powering the VLF converter with a closed A-B jumper might severely damage your receiver. So unless you know what you’re doing leave the jumper open and use an external 12 volt DC power supply. I always place IC’s on a small piece of circuit board, instead of glueing them “dead bug” on the clad. The output circuit, mixer and oscillator are in place. Just checking now and then if everything still fits within the tin case. Added the amplifier and the first shield. 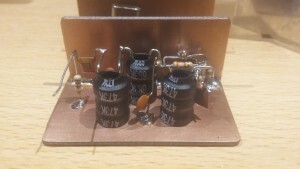 The input filter with 47 and 68 mH inductors. The converter PCB ready to put in a case. Wiring the unit for a first test. Ready to close the lid. 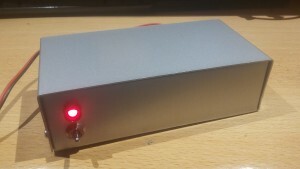 The final result: a nice box with power switch and LED indicator. Connectors for 12Vdc, RF in and RF out are on the back. 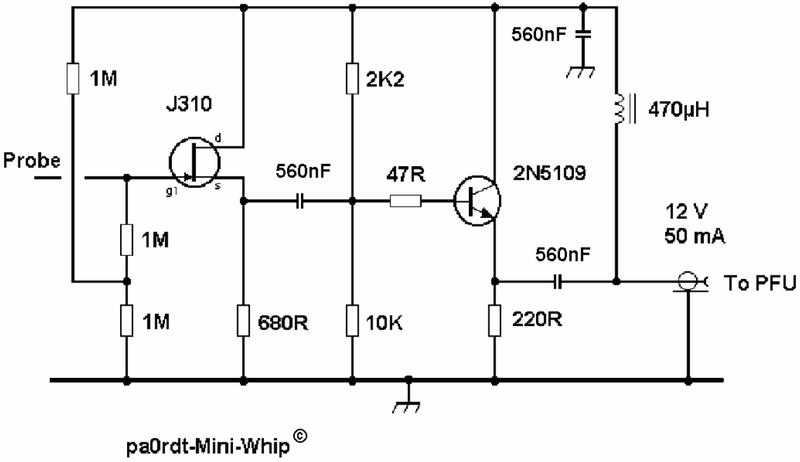 Circuit of the PA0RDT Mini-Whip. The “probe” is a piece of sheet metal or copper, about 3 x 4.5 cm, connected to the gate of the J310 FET. The circuit is powered with 12 Vdc over coax. 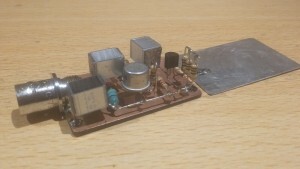 The Mini-Whip was designed by Roelof PA0RDT and first published in the magazine of the VERON (dutch amateur radio society) called Electron, in May 2006. 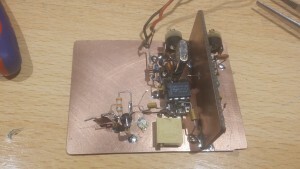 To understand this antenna you may read this excellent article by Pieter-Tjerk PA3FWM. It is an active antenna, great for receiving radio signals from almost DC to 20 MHz. 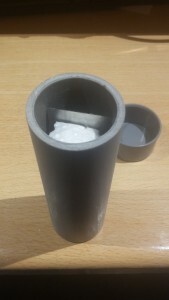 The antenna itself is very small and can be build into a small plastic box or a piece of 40mm drain pipe. 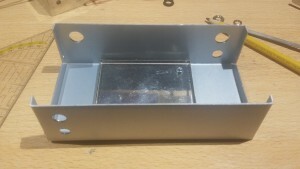 I built it on a small piece of copper clad, but it is also sold as a kit (PCB + parts) by several webshops. The circuit is typically powered over the coaxial cable, which makes it very easy to place it somewhere outside in an open area. But you may also install it on your balcony, using the railing as ground. Grounding the antenna is very important, and the pole should not be conducting (e.g. tonkin stick or PVC pole). I didn’t want to wait for a kit to arrive, so I built it Manhattan style. There was no 2N5109 in my stock so I used a 2N3866 instead. I also used 1 uF MKT capacitors instead of the 560 nF’s, they are meant for DC decoupling so their value is not critical, however for VLF purposes I would recommend to apply at least 1 uF otherwise you might loose some low signals. I placed it in a piece of drain pipe, closed with caps. It took me just two hours to build. The Mini-Whip is just a few components. The finished antenna, ready to place in the field. 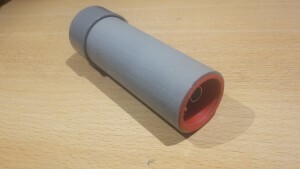 I put the PCB and probe in a piece of drain pipe, using some foam to keep it in place. 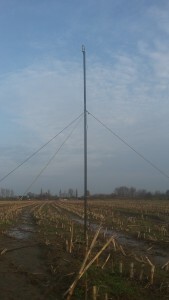 The Mini-Whip on a 350cm pole in the field. Grounding the antenna is essential for a good reception. I invited Adrian PA0RDA to join me in listening to the SAQ broadcast on Christmas Eve 2015. After breakfast we tuned to 17.2 kHz and waited for the first signal. At about 7:30 UTC a carrier appeared. After some more carriers they started keying ‘vvv vvv de saq saq’, which was the actual confirmation that we were receiving SAQ. The signal was really loud and the receiver was almost blocking, so I switched the attenuator to -20dB. The signal was now very clear. The operator was using a straight key, but his fist was almost perfect. After some minutes he pressed the key down for a couple of seconds, resulting in a long continuous carrier. The tone lowered just a bit, then returned to the original tone. The long carrier was probably a heavy load for the transmitter, causing the engine to speed down a bit, then the speed was corrected thanks to the feedback mechanism in the engine. After the carrier he started sending ‘vvv’ again, the first ‘v’ sounded a bit higher in pitch, since the engine was speeded up after releasing the carrier, then again the frequency was corrected. The same happened again a few minutes later. It was absolutely great to experience this, SAQ is indeed a machine transmitter! At 8:00 UTC they probably changed operators, since the operator’s fist became really different but still good to understand. They started the broadcast and announced the station’s name, and that they were using 200 kW output. Then they wished all listeners a merry Christmas and happy new year and ended the transmission. The broadcast took just 6 minutes, after that it became quiet again, just some noise on an empty frequency. It was really satisfying to have such a great reception of SAQ! The time to build the VLF converter and Mini-Whip antenna was well spent. I can’t wait to tune in again for the next broadcast (probably next summer…). Very interesting article, Ernest! Thanks for sharing with us. Interesting stuff about VLF reception. Do you use the B41 Murphy also for this purpose ? I use the murhy B41 and the RA37 +Racal RA17L for picking up the SAQ signal. Murphy B40 B41 62B equipment collector and user. I have never owned a Murphy, it would simply take up too much space in my shack. Still, those Murphy’s are great radios to operate, I love those huge handles/dials and the cylindrical scale in the center. I took this B41 picture in a friend’s shack.